Over the years, we tend to forget the way we used to do things, even when those old ways might have been better. Such is the case with sleeping in two segments, which was quite normal before the invention of electricity freed us from the day/night cycle that had previously ruled our lives. This “second sleep”, which has been mentioned in literature such as The Canterbury Tales, came after a short period of wakefulness in the middle of the night. Individuals would go to sleep when the sun went down, and wake sometime around midnight. They would stay awake for an hour or two before going to sleep again until dawn. Researchers are beginning to look into this way of sleeping, and are finding that it may be the norm for humans who aren’t influenced by artificial light. They’ve also found that during the period of wakefulness in the middle of the night, individuals are in an extremely relaxed state. So, if it’s our natural way of sleeping, why don’t we do it anymore? 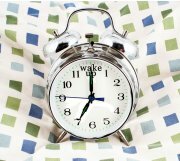 When you go to bed at sundown and don’t fully wake for the day until dawn, you may get as much as 11 or 12 hours of sleep. Healthy humans don’t need that much rest, so a split sleep pattern makes sense. With the invention of electric lights, however, we’re able to stay awake and be productive well past sundown. When we finally do sleep, many of us don’t go to bed early enough for even the bare minimum amount of healthy sleep.